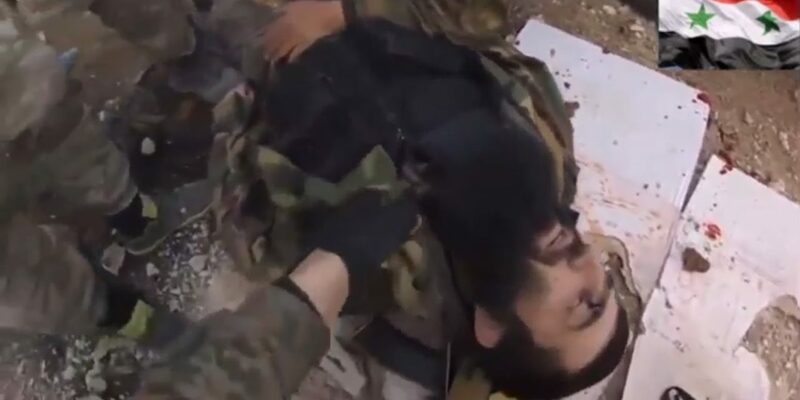 Earlier this month ethnic Chechen jihadi Sayfullakh Shishani was killed as insurgents attacked Aleppo Central Prison. Sayfullakh and his jamaat, formerly known as Jundu Sham, joined the Islamist faction Jabhat al-Nusra in December. Sayfullakh was formerly the second-in-command to the Chechen jihadi Umar Shishani in the predominantly Chechen faction Jaish al-Mujahideen wal Ansar (JMA); however, Umar expelled Sayfullakh and several of his men from JMA in August, accusing them of “fitna”. Sayfullakh formed his own independent brigade, for some time fighting with another leading Chechen jihadi, Amir Muslim Abu Walid Shishani. In December, Sayfullakh and his jamaat decided to pledge allegiance to Jabhat al-Nusra, although they remained a coherent unit within that faction. The video shows footage taken by a Russian-speaking member of Sayfullakh’s group during the storming of the Aleppo Central Prison. It shows Sayfullakh commanding a small group of mostly North Caucasian fighters. The group is not involved in the suicide truck bomb attack on the prison but appear to be positioned somewhere on the perimeter fence of the prison. The small group runs into difficulties when they come under heavy fire and appear to have to turn back; they make it to a Jabhat al-Nusra held stone outhouse building but there come under fire – possibly air fire – and Sayfullakh is hit by a bullet or shrapnel. The Aleppo Central Prison and freeing it had become important to Sayfullakh. After his death, Jihadi sources published a tribute from the leader of Jabhat al-Nusra, Abu Mohammad al-Jolani, who said that the Chechen fighter had insisted he be allowed to storm the Aleppo Central Prison as a condition of swearing his oath of allegiance to Jabhat al-Nusra. Another leading Chechen fighter, Amir Muslim Abu Walid Shishani, is also present in the assault (he is seen at 15:24 in the video). Amir Muslim is a veteran jihadi, who fought in Chechnya and Dagestan alongside Arab foreign fighters. Amir Muslim has remained independent throughout the Syrian conflict, refusing the swear allegiance to the Islamic State of Iraq or to Jabhat al-Nusra, but fighting alongside them on occasion. Amir Muslim was prominent in the Lattakia offensive in August-September, when he captured several regime-controlled Alawite hill-villages. At 15:24, there is more footage from inside the prison, and we see Amir Muslim Abu Walid Shishani. The cameraman addresses him, and asks him to say something. Muslim says that they are carrying out a survey of the area, and then it will be time to go. We then see Sayfullakh, who is with a group of fighters immediately prior to the storming of the prison. They are being prepared with a speech in Arabic about jihad. Sayfullakh – who appears nervous – joins in with an “Allahu Akbar”. We see Amir Muslim briefly appear again to join Sayfullakh as the fighters move out. We now see footage of the fighters moving from one area to another along a footpath, with the sounds of gunfire in the background. The next section of the video is titled in Russian: “The Brother Before the Suicide Operation”. We see the explosives-packed truck, and several fighters standing around it. One – the suicide bomber – is dressed in white and wears a black headband. The Russian cameraman tries to interview him, but there is a language problem: the cameraman does not speak Arabic, and the suicide bomber speaks only English (with a British accent), which the cameraman does not. The cameraman asks, hopefully, whether the suicide bomber speaks Russian but he does not. The bomber then says that his tongue is tied in a knot, but that his actions come from the heart. That is the last we see of him: the next shot shows the explosives-packed truck driving in the distance to its grisly destination. At 39:38, we hear someone say, “Sayfullakh, there’s nothing to do.” The men then turn back and start running in the direction they came from. The perimeter wall that was offering some cover ends, and the men have to make a run for it towards a sentry post. At the next section of cover, Sayfullakh yells at the men to sit down. They desperately try to help one man, who is wounded. The men finally make to an outhouse, outside which several cars are parked; but there is a sudden volley of explosions and gunfire and they have to take cover behind the cars. In the attack, Sayfullakh is hit by a bullet. His comrades drag his body into one of the cars. The battle carried on until nightfall. The infidels used air power against the Mujahideen, heavy artillery, poison gas, and other types of weapons. During the operation, 14 infidels were annihilated, including the head of the prison and a minimum of three Assadi commanders. The operation continues. Pray. Victory or paradise!